If you are looking for Alaska’s top activities and attractions, look no farther than Anchorage. Consider the top 20 things to do in Anchorage as you plan a visit and make the trip complete. There are more than a thousand of these iconic, antlered animals in Anchorage alone. Spend a little time here, and you’re sure to find one. There’s even a little-known moose spot a few miles from the airport. Spend a little time in green spaces, and you’re sure to find one. In a pinch? Head to the Alaska Wildlife Conservation Center or Alaska Zoo for a guaranteed date with a moose. The landscape surrounding Anchorage is studded with these gems. Want to see a bunch all at once? Take a day cruise from nearby Seward or Whittier, or take to the air on a sightseeing flight. The Alaska Native Heritage Center is one of the best places to get an introduction to Alaska Native traditions and language. With many Native cultures in Alaska, each has its own distinct features. The railroad is what gave Anchorage its start, and first linked broad stretches of Alaska together. The city is still the starting point for rail travel in Alaska, with trains departing daily in the summer for Seward, Prince William Sound, Denali, Talkeetna and Fairbanks. 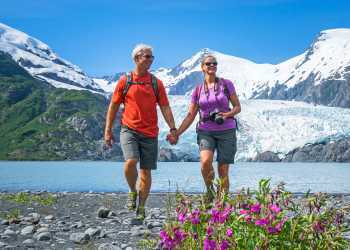 Check out the Glacier Discovery train to Spencer Whistle stop, it’s an easy – and incredible – day trip while in Anchorage. Anchorage’s bike paths travel 135 miles through the city, and the crown jewel of the system is the Tony Knowles Coastal Trail. Rent a bike downtown, and take off on the 11 mile, shore trail. The Anchorage Museum is the largest museum in the state. This isn’t just a city museum, it shares the story of Alaska. These art and history galleries are the best primer for a trip through Alaska. Flightseeing is one of the best ways to explore the mountains, soar over glaciers, and spot wildlife from above. Anchorage has more pilots and planes per capita than any place in the U.S., and the busiest floatplane base in the world is here too. The Chugach Range is the closest wilderness area, with access points a short drive from anywhere in the city. Find a piece of this 9,000-square-mile mountain range to call your own for the day. Take a hike, raft the rapids, or just sit in the forest in peace. Anglers find five species of salmon in local waters, not to mention trout, grayling and Arctic char. And there’s no need to mount an expedition. Anchorage&apos;s most popular salmon fishery is a stone’s throw from the city center. King and silver salmon return to Ship Creek every summer. Anglers aren’t the only residents who follow the fish. Beluga whales chase salmon runs just off the coast. Take a trip down Turnagain Arm to spot them. These white whales get as big as a car. Looking for bigger species? Continue on to Seward or Whittier for a day of whale watching. Indian Valley and Crow Creek were the site of gold strikes at the end of the 19th century. Gold panning is still a common pursuit, and with a pan, persistence and a little patience, anyone has a shot at finding flakes of Alaska gold. Alaska is the only place in the U.S. with black, brown and polar bears. Anchorage bear viewing often involves a short flight to a salmon-filled stream in Katmai or Lake Clark national parks or nearby Chinitna Bay. Here visitors can view the bruins, big coastal browns, without disturbing the bears. Active from September through April, the northern lights dazzle. Night owls can pursue the shifting colors of the auroras near Anchorage. Eklutna Tailrace, Girdwood, and the Knik River Area are all popular spots for a night of viewing. The state sport may be a winter pursuit, but mushers welcome visitors to their kennels year-round. Learn about racing sled dogs, take a ride on a cart, and hold a whole litter of cute puppies. To get sliding on snow even in summer, several mushers camp out atop glaciers for the summer, with helicopter access to the seasonal retreats. Between March 20 and September 22, Anchorage has more daylight than anywhere in the other 49 states. Gaining five minutes a day – as much as a half hour each week – it’s incredible how much fits in a day when the sun barely ever sets! Find authentic works straight from the artist. Whether you seek out traditional Alaska Native art, innovative crafts from a young entrepreneur, or salmon or local candy to take home and share, Anchorage is the spot to find it. Here&apos;s something to sweeten the deal more: shopping in Anchorage is tax-free. Flying isn’t the only way to get an aerial view. The Alyeska Tramway swoops over treetops, taking passengers 2,000 feet up Mount Alyeska. Seven named glaciers, kettle ponds and sparkling Turnagain Arm are all visible from the tram. Local fare includes king crab, halibut and salmon naturally. But there are a few curveballs in Anchorage cuisine. Try reindeer sausage, or veggies fresh from the nearby Matanuska Valley. Anchorage is also an under-the radar beer town, with more than a dozen breweries in the city. What Alaska visit is complete without exploring the national parks? Anchorage’s proximity makes visiting multiple parks easy. Fly over Denali, check out Kenai Fjords on a day cruise or kayak trip, and take off for Lake Clark or Katmai for bear viewing. Tides in Anchorage are extreme, with some of the highest tides in the world. The shallow, narrow waters of Turnagain Arm help form a bore tide, a wave up to 6 feet tall that rolls for miles along the inlet. The Seward Highway is dotted with good vantage points to watch this natural phenomenon, and perhaps even spot the intrepid surfers who seek to ride the wave. Get insider travel tips for Anchorage.